A Going Concern: Erin Ross and her Guitar | MUSICAlive! She looks too young to play good roots, but don’t be deceived . . . . she does! evening begins upstairs with the roots-grounded artist Erin Ross, whose folk-rockish set ends around the time the floorboards begin vibrating with the punk music fundraiser cranking it up downstairs. Variety is the spice of life, after all. That’s not surprising. Her two EPs, Sweet Thing (2008) and Another Empty Day (2009) move within the narrow roots-flavoured range familiar to Westerners who listen to live music around Alberta and the other prairie provinces. Both discs contain a traditional tune she covers, and a Ross original, more country-swing styled on the earlier release, and “more of a blues bent (on the second). And the third one, which we’re just working on the mixing of right now, will be a little bit jazzier.” She laughs again. During her Friday night performance, Erin and her band really ranged back and forth across this spectrum, so it doesn’t seem like her releases are a progression from one style to another. Erin agrees. “I play a lot of finger-style; I play a lot of country-blues; I play a lot as a solo performer, and that tends to be a little bit mellower. And then I do the odd show with the band, and use that as an opportunity to rock out a little bit more, go for fuller arrangements, more guitar solos, and that sort of stuff,” which can see Erin with drummer Holly Magnus and an electric or upright bassist like Spider Bishop, as she was that night. A great groove. I suggest that she’s not writing much because she’s such a going concern: Erin Ross plays two to four shows a week, which is quite an accomplishment for someone who rarely leaves the west. There’s only so many clubs that will pay for an artist who’s not performing Nickelback or Reba McEntire covers. Now, if you’re older than the Jonas Brothers, or a FFWD regular, this will mean something to you: all of these EPs “are actually released as 7” vinyl. So it’s a 45 (rpm, if you must ask), so there’s only one song to each side.” Which is why the CDs mention Side A and Side B: they’re not kidding! 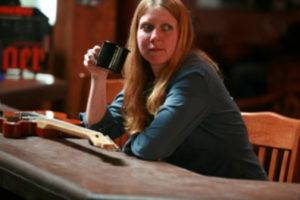 So besides playing solo country blues at the Auburn every Thursday from noon to 1:30, Erin and her trio will be playing at Mikey’s Juke Joint & Eatery on May 21st starting around 9:00, kicking up their heels and maybe, if you’re really lucky, she’ll play some Mississippi John Hurt.